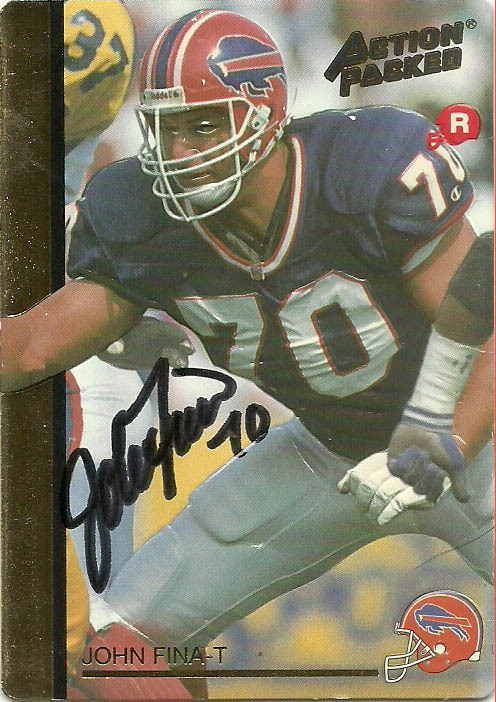 After redshirting in 87 and then playing defensive line the following year, John Fina found a home at offensive tackle in 1989 at Arizona. By the time he graduated, Fina was a top rated and accoladed prospect for the 1992 draft. He’d be selected near the bottom of round 1 by the Buffalo Bills. Fina didn’t start any games his rookie year for the Bills, but got his brief moment in the sun catching a tackle eligible TD pass during a Saturday Night game against the Colts. 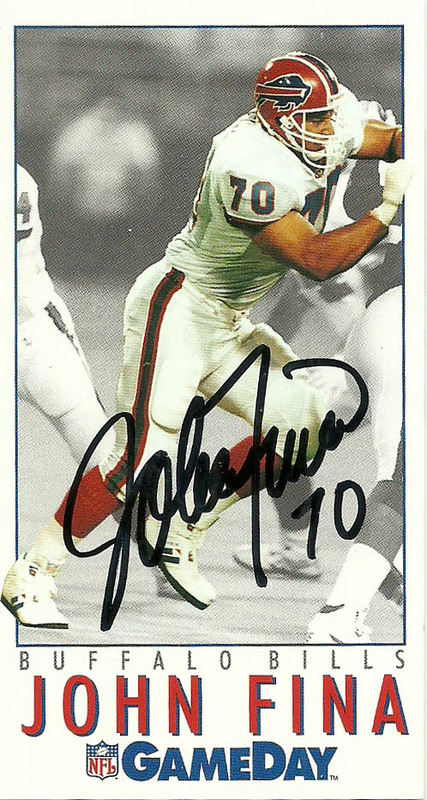 With the departure of Will Wolford, John became a fixture at left tackle for the Bills starting 131 games (2 Super Bowls) over the next 9 seasons from 1993 to 2001. He played one final season in Arizona in 2002 and then retired. John is notable for being a good tactician, who was quick on his feet, and was lethal in run blocking. A native to the Arizona area, I talked to John about my travels through Tuscon, and stopping at the Motel 6 conveniently located near the junction of I-10 and the route to Tombstone. I also briefly mentioned the bizarre velociraptor statue standing outside the McDonalds in the area as well. John has a well practiced autograph on these two cards. The loop in the F and the A in his name almost connect. I hadn’t gotten around to John yet because his Action Packed Rookies card looks so pedestrian… I think this is because his hands do not play a prominent role in the photo and he’s pass blocking, so there’s almost a pensiveness to the composition. I also feel like the size and the location of his autograph on this card match the temperament. Quite the opposite with the GameDay entry. You can really feel the drive block occurring off the canvas and the autograph itself scales in size and angles with the figure. 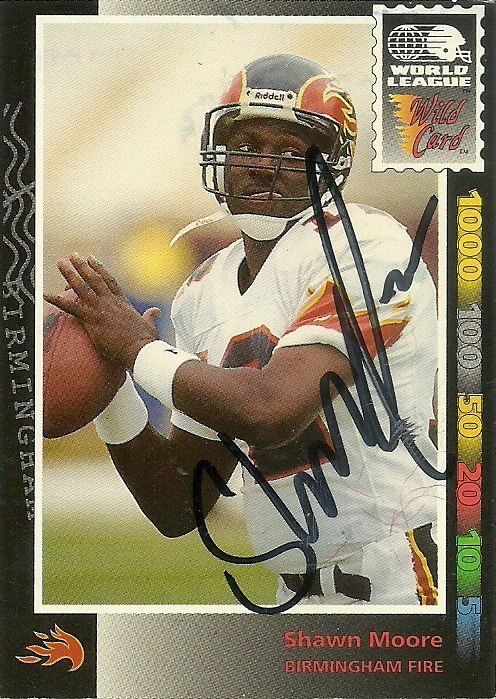 John is a decent signer TTM and is very good to fans in general. Since retirement he’s done some TV work, most notably appearing on a TV food show as a judge. 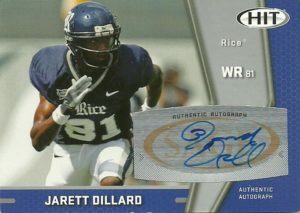 Jarett Dillard played for the Rice Owls back in 2005. He posted 3 1,000+ yard seasons back-to-back-to-back. 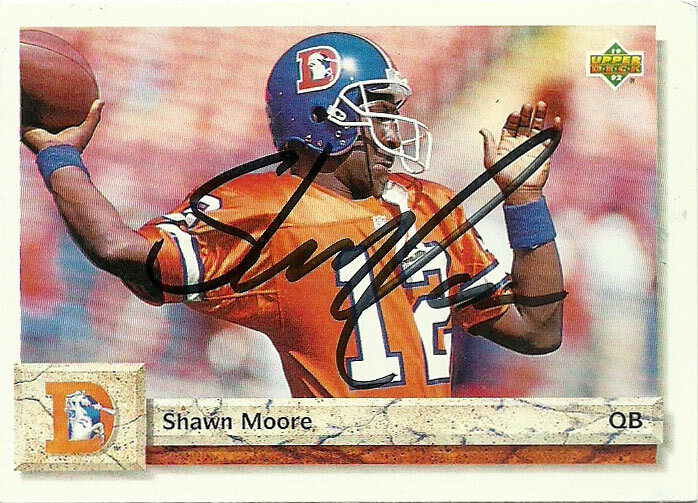 In both 2006 and 2008 he had 21 and 20 touchdowns receiving- respectively. Dillard owned many of the receiving records at the school upon his graduation. He finished his collegiate career with 4,138 yards on 292 catches and a whopping 60 touchdowns receiving- an NCAA record. Jarett was selected in the 5th round of the 2009 NFL Draft by the Jacksonville Jaguars. (At 5-10, 185, it was thought that Dillard could not stand the rigors of a full NFL season.) During his rookie season he logged 6 catches for 106 yards, before suffering a season ending broken ankle. Dillard’s season was ended before he even played a down in 2010, when he injured his foot and was placed on IR. In 2011, he started 5 games and caught 29 passes for 292 yards and his only professional TD – an 11 yard pass from Blaine Gabbert in a 17-3 win over the Indianapolis Colts. The following year in 2012, Jarett was released before training camp. He’d sign with the Lions but not make the final cut. Dillard signed with the Cardinals in 2013, but again failed to make the final roster. Jarett retired and went into practicing law, specifically: Construction litigation, contract disputes, and alternative dispute resolution, to go along with Mechanic’s lien filings… both domestic and international. So every once in a while I pick up a Walmart or Target Autographed memorabilia hangar box. It’s a cheap frill, that keeps the autograph beast at bay for a few days while I wait for a TTM to arrive. Typically they do not hold very much of value. I like the Walmart ones just a bit more because they typically have one autograph and one bonus patch along with 4 packs of cards. In this box I got not only this autographed Jarrett Dillard card, but also a patch card- autographed by Christine Michael. Not a bad find for 10 bucks.